Fiction – Kindle edition; Hachette Digital; 384 pages; 2012. Translated from the Japanese by Alexander O. Smith. When I read Keigo Higashino’s The Devotion of Suspect X in late 2011, I thought it was one of the most extraordinary crime novels I’d ever experienced. It was a masterpiece of plotting filled with so many twists and turns it was impossible to guess the ending, and I loved every (restrained) word of it. 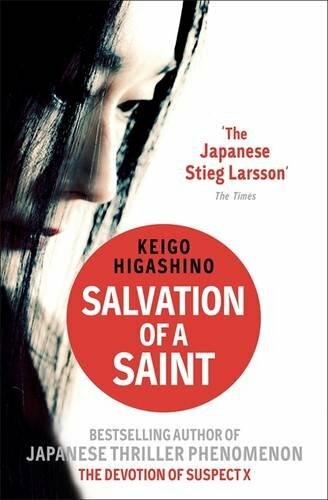 When Jeff, who comments here every now and then, told me last summer that there was a new Keigo Higashino novel in the offing I eagerly awaited its UK release. For some strange reason Salvation of a Saint was made available in a Kindle edition a few months before the hardcover hit out shelves (on 7 February), so I bought it because I honestly couldn’t wait to read it. But this book is quite a different kettle of fish to its predecessor. Salvation of a Saint is a very detailed police procedural focusing on the death of a young married man inside his empty apartment. Yoshitaka is found face down, sprawled on the wooden floor, with a spilled cup of coffee next to him. Tests reveal there was poison in his coffee. There are two suspects in his case: his devoted wife, Ayane, an artist who makes beautiful quilts for a living, and Ayane’s young apprentice, Hiromi, who has been having an affair with Yoshitaka. From the outset we know that the husband is not a particularly nice person. Just a day or two before his death, he told Ayane he wanted a divorce on the basis that she hadn’t fallen pregnant yet. They had been married just a year and he didn’t see the point in “continuing on like this if we can’t have children”. But there’s a hitch: Ayane was hundreds of miles away visiting her parents when he died. So she can’t be to blame… or can she? Once again Higashino dishes up a murder mystery like no other. From the outset the reader is let in on a little secret. Just after Ayane is told that her marriage is over “she glanced at her dresser, thinking about the white powder hidden in a sealed plastic bag. […] Guess I’ll be using that soon, she thought”. But we are left in two minds about this powder: is it the poison used to kill Yoshitaka, or something else entirely? We don’t find out until the very end, but as we follow the police investigation step by step you want to reach into the book and tell Detective Kusanagi (who also featured in The Devotion of Suspect X) and his department’s newest recruit, Kaoru Utsumi, to look in the dresser, look in the dresser! Of course, if they did that the mystery would be solved in about 10 pages rather than the 384 pages it takes to tell this story. Instead, Higashino teases us with plenty of red herrings and twists and turns in the plot so that you are never quite sure what is going to happen next — and you’re never quite sure if Ayane is truly guilty or not. Her performance throughout is mesmerising — she’s cool, calm and collected, the last person you’d expect to be capable of murder. At times I must admit the book feels tedious — that’s probably because the police investigation is so painstaking — and the solution is quite contrived and highly implausible. But I did enjoy the police banter, particularly the tension, competitiveness and humour between Kusanagi, the old, jaded detective who’s seen it all before, and Utsumi, his female colleague, who is young, bright and tenacious. The university physicist Yukawa, who secretly helps out the police on their most baffling cases, also makes an appearance (he was in the previous novel, too) — his “unofficial” work is vital in helping the police crack the case. And while I don’t think Salvation of a Saint is a patch on The Devotion of Suspect X, it is nevertheless a good read about a complex, puzzling case with an emphasis on deciphering clues and figuring out how a simple crime could be committed so perfectly. If you’re looking for a crime novel that is refreshingly different, do give it a try. As you know, I bought this one this week. It will be interesting to read, as I wasn’t a huge fan of The Devotion of Suspect X…perhaps I should think of it more as a crime novel rather than a Japanese translation. As soon as I saw the cover blurb “The Japanese Steig Larsson”, I moved on because I found The Girl with the Dragon Tattoo repugnant. But then I saw your review again on GoodReads and reconsidered. Does Salvation of the Saint have the same hard-core elements that Larsson’s book does? It otherwise sounds like an excellent story. Oh god, I don’t know why marketing departments do this — they think it will shift copies but comparing these two authors is completely laughable. Just ignore the Steig Larsson sticker. There is absolutely no violence in this book. It’s actually quite old-fashioned, almost Agatha Christie-like in its gentleness. I hope you get to read Suspect X at some point, Stu… would love to know what you thought of it. In that book you know who the murderer is from the outset, but the book works because you want to know if they will get away with it. I would read everything Keigo Higashino writes. I read Suspect X, like it but not as much as Villain by Shuichi Yoshida. This one sounds good. Thanks for reminding me about Villain by Shuichi Yoshida  I have been meaning to read that one for quite awhile now. For me the only flaw I can ascribe to Villain is that it gets off to a bit of a slow start, at least that’s how it felt to me. But once it picks up, it’s a great read. I wish some of Yoshida’s other work would be given English translations, I notice some of his other books have been given translations in France for instance. Keigo Higashino is clearly one of the most popular J-Lit authors going around atm because another of his books is getting an English translation next year – Journey Under the Midnight Sun is set for a May 2014 release according to Amazon UK. I really do need to read Villain as I’m yet to hear a bad word about it. And thanks for letting me know about the new Higashino… I’ll be adding that one to my wishlist for sure.